Hi gang! 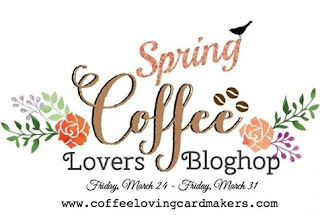 Stopping by really quick to share a project for the Spring Coffee Lover's Blog Hop! I look forward to this because I love seeing everyone's projects featuring coffee/tea/cocoa! Me, I'm a coffee gal but I enjoy tea and cocoa too. 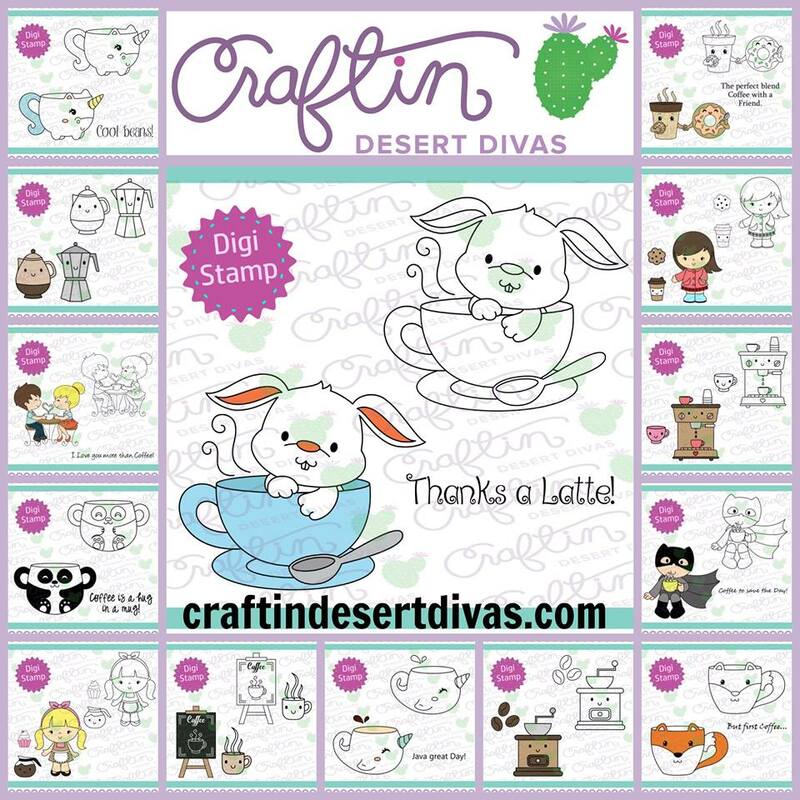 My project features an adorable digital stamp from Craftin Desert Divas that is being released just for the blog hop! The image is colored with Copic markers and the little sentiment tag comes from the Doodlebug Cream & Sugar paper pad. Other supplies used are listed below. 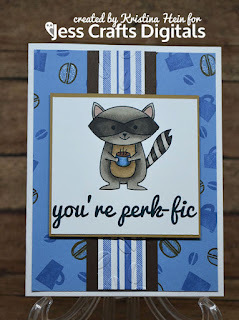 I'm probably totally dating myself with today's title but I don't mind at all! 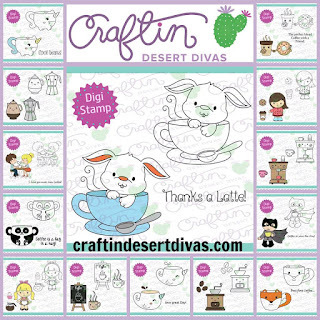 It just seems to fit with my project today.😊 Have you checked out the new Craftin Desert Divas release that went live yesterday?? Have you done a little shopping?? 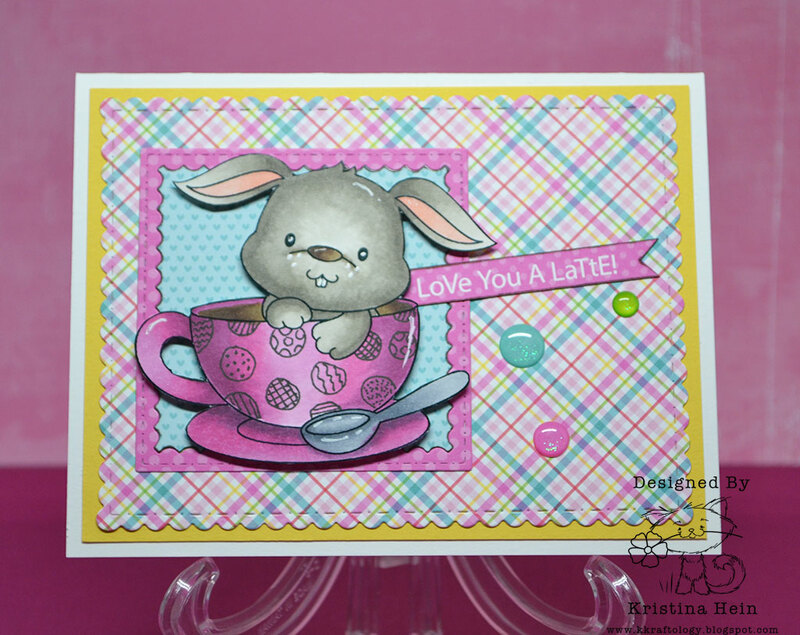 There are so many wonderful new stamps and dies available. If you haven't, hurry on over to the CDD store right now! Both of the Design Teams have done a fabulous job of bringing you lots of creative inspiration too. When I got my hands on the new Fox Villain digi stamp, I had an idea pop right into my head. I knew just what I wanted to do. The hard part is taking the idea out of my head and making it actually work on the card! I'm not going to lie. This card was a labor a love but I feel like I successfully translated my idea to paper! I used the new Building Dies, Fox Villain digi and Unicorn Hero digi. I had to make a prototype of the card to make sure I had everything sized just right and would all fit. The grass and road I just free hand drew in with my copic markers. I also took BG0000 and BG000 and created a sky with a few cloud details. For the building, I used a couple of blue markers to color a white piece of paper and then die cut it out. The fox and unicorn I had to size down a bit. These too were colored with Copics. For the pet plant (aka Seymour) I realized the plant stalk wasn't going to be long enough. No problem. I just cut it apart right at the leaves. I held the top part in place and the bottom where I wanted it to be. I used a Copic safe black marker and extended the stalk. I colored it in to match the other two pieces. I used another set of smaller leaves to cover the section where I joined them together. It's like magic! After that it was just a matter of putting all of the pieces in place. I did pop up the pot on the plant and Unicorn Hero with foam tape to add just a little more detail. Well hello there. Yep, I'm back with another project to share! I did mention I was going to be keeping super busy for the next week or so. 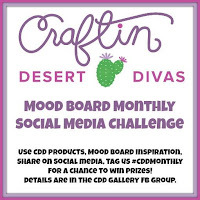 I'm here to share some more inspiration featuring the awesome colors on this months Social Media/Mood board challenge! 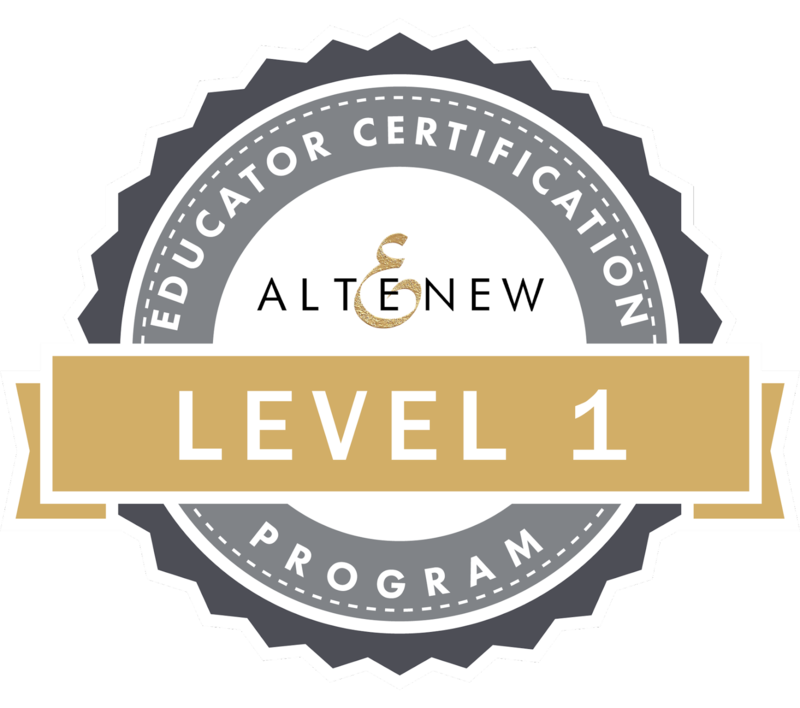 Have you had a chance to participate yet? You should! 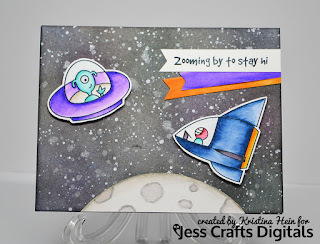 My card today was colored with Inktense pencils and a watercolor brush. Yep, that is another handmade plaid background. I hope you aren't getting tired of them yet! 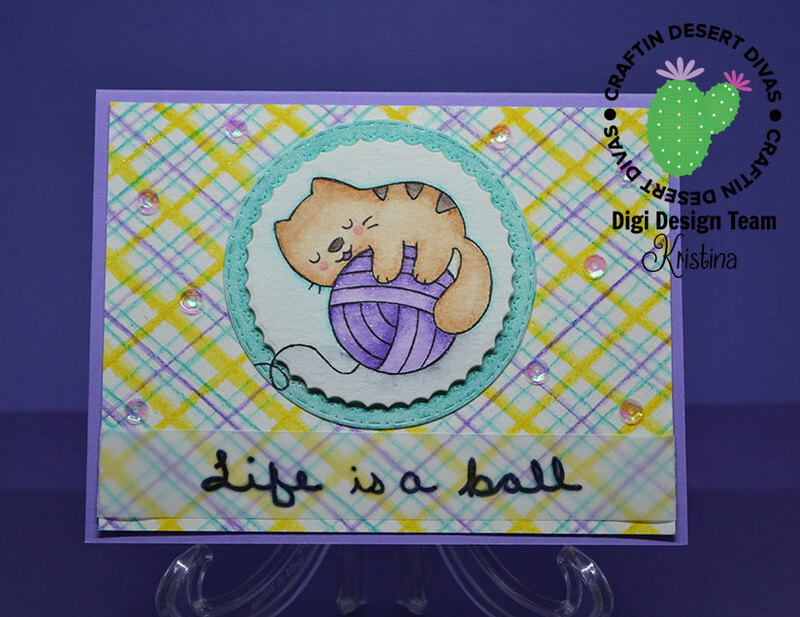 It features the adorable Have a Ball digi stamp. After coloring the stamp, I went back with a fine tip black marker and traced around the entire image. I love how it helps to make it pop! 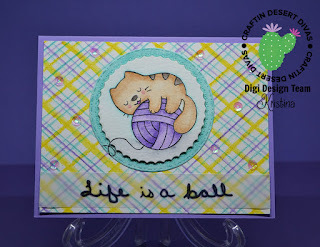 I cut it out using the fabulous Inside Scalloped Circle dies. I adhered the outer circle directly to the background but popped the kitty up on some foam tape. Just to give it a little extra dimension. The actual sentiment is included with the digi but I decided to hand write it because I wanted to emboss it. I wrote it with marker on vellum, let it dry for a bit and then went over it with a Versamark marker. 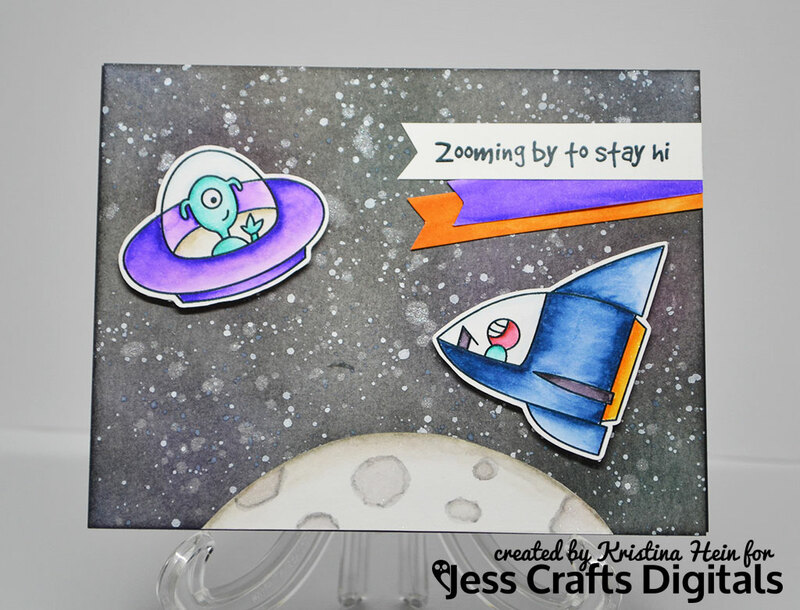 I sprinkled on clear embossing powder and applied my heat tool. I wrapped the vellum around the panel so I could hide the glue. As a final touch I added Spectrum Noir glitter marker to the ball. You know how I am with sparkle! Oh, and don't forget the gorgeous Shimmer sequins I added! Hi everyone! I know I haven't posted for a while but I'm back and this month is going to be a busy one! So I'm just going to dive right in with my project for today. I'm so in love with this digi stamp and it's called My Best Buddy. 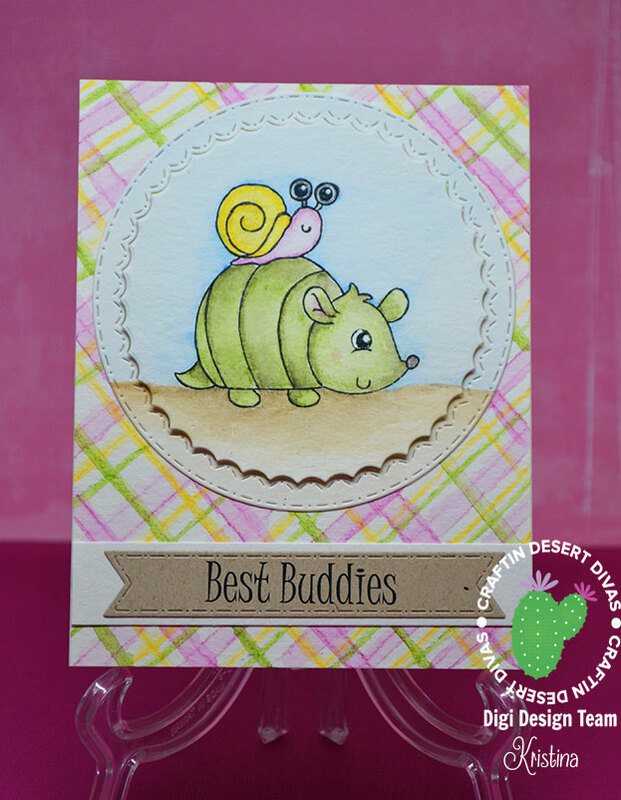 The cute armadillo with his snail pal riding on his back! Oh the cuteness! Picking this stamp was easy but now I needed a color theme. 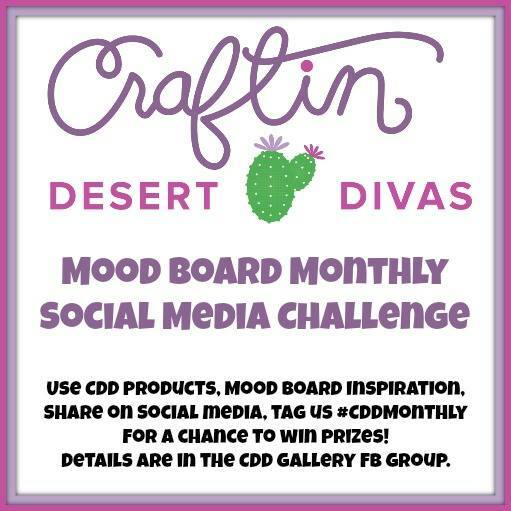 Have you seen this month's challenge inspiration in the CDD Gallery Facebook group yet? 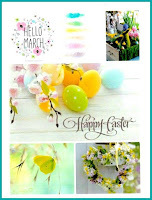 It's fabulous and just perfect for making some spring cards. Here it is if you haven't seen it. 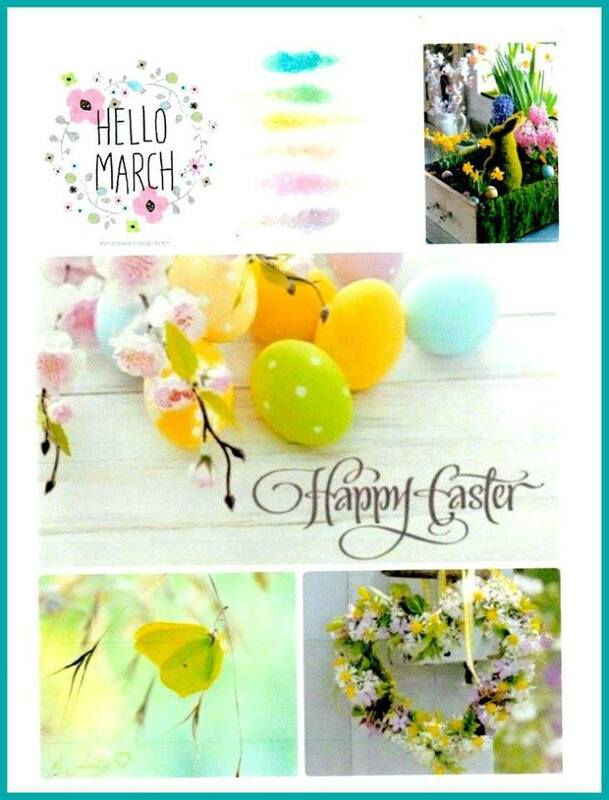 You have plenty of time to get started and make something fun! You have a chance to win one of three prizes. I promise you will have fun. Back to my project. Color scheme chosen. Hmm, now what medium do I want to use?? I saw my tin of Inktense pencils were gathering dust. A sure sign I needed to put them to use! I colored the critters and grounded them with a little ground and sky. I also went around the entire image with a black fine tip marker to make it pop out. 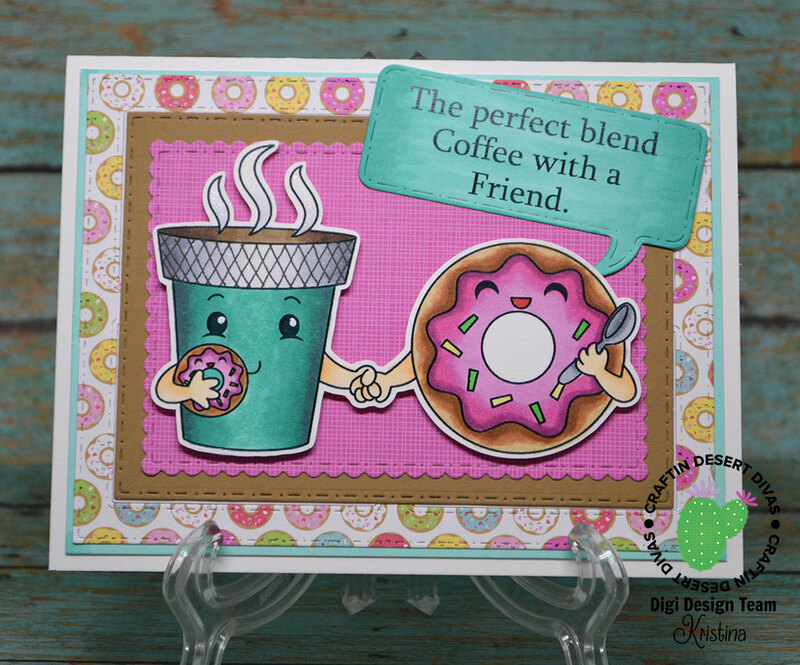 I cut it out using the brand new Inside Scalloped Circle dies. I'm still on a plaid kick so I dedided I would make my own plaid. The twist this time was that I used my Inktense pencils! They were already out on my table just begging to be used some more. I drew the lines with the pencils and went over it with my water brush. I just love how it turned out. You can bet I'll be making more plaids with my Inktense pencils in the future! I adhered the outer circle directly to the background but used foam tape to pop up the inside of the circle. I think it gives a bit more interest. 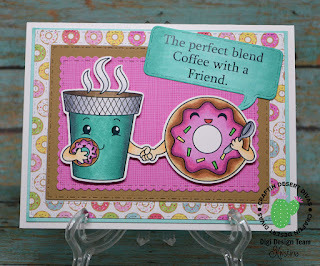 I used the sentiment that comes with the My Best Buddy digital stamp. I printed it out on kraft cardstock and used a die from the Flag Banners die set. I swear I use the Flag Banners die set all the time! I adhered a strip of watercolor paper down and then added the sentiment strip. All done!